Ryanair, the Irish low-cost air carrier, was holding talks last month with Bulgaria's Plovdiv airport to commence flights from there. The meeting was to speak to Transport Minister Alexander Tsvetkov and to potentially finalise an agreement. Ryan Air has had intentions of launching flights from Plovdiv airport for a couple of years. According to Plovdiv airport executive director, Doychin Anguelov, the attraction of low-fare air companies is part of the airport’s strategy to increase its passengers and revenues. As of 1st April 2010, the fees at Plovdiv airport were due to be sharply reduced to almost three times lower than fees at Sofia airport. Sofia has experienced a surge in the construction of large shopping malls over the last 1-2 years. The city now boasts a great selection of modern shopping malls with a large selection of stores selling well known global brands and also top Bulgarian brands. The malls also feature a selection of restaurants, international coffee shops (Costa, Starbucks, etc), a large number of parking spaces, and some of them also have a cinema complex. Some of these malls include: Serdika Center, City Centre Mall, Mall of Sofia, The Mall, and Sofia Outlet Centre. ‘The Mall’, which is located at 115 Tsarigradsko Shose, is the most recent one to be opened and this is now the largest shopping center in Bulgaria. It also contains the first Carrefour hypermarket in Sofia. The apartments are now largely completed except for one additional coat of paint and another clean. We have been waiting on the warmer weather to arrive before applying the final coat of paint in the apartment building so we are now able to proceed with this. These remaining items should be completed next month. The reception area has been finished and is looking well. We are waiting on the pool company to tile the pool and this should happen over the next few weeks. Other items that need to be done in the complex include some additional landscaping and a very large clean up of the grounds. It is an exciting time as we near the completion of the complex. We will email all our clients to inform them when we reach this stage. You can check our website to see the latest photos on our construction updates. As we approach completion we are increasing our focus on the marketing and the rental of the complex. A number of months ago we launched two websites to advertise the chalets and the apartments. The idea behind launching these websites much earlier than when we would be taking bookings was to increase rankings in search engines such as Google. 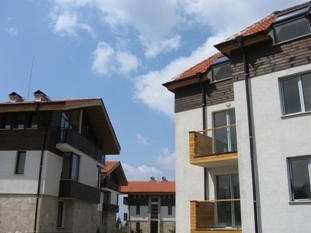 Our main advertising website for potential renters is: www.skiapartmentborovets.com and this contains loads of information about the chalets, the apartments, the facilites in the complex, and the services we provide including airport transfers and ski hire. We are continuing to work on this website to improve search engine rankings. Our Rental and Property Managment brochure is being finalised at the moment and will be issued in the coming weeks. This brochure contains information on both rental services and services to maintain our clients properties. It documents how owners can expect the complex to be run, maintenance of their property, and information on receiving their rental return. It also contains information and services for owners who do not wish to rent out their properties but need some property care throughout the year. The Transport Ministries of Bulgaria and Qatar have signed an agreement which includes regular services of Qatar Airways to Sofia, starting in October 2010. There will be direct flights between Doha and Sofia, as well as Qatar Airways being able to use Sofia Airport for connecting flights to other European destinations. The two countries have also signed an agreement to create a joint investment company with a starting capital of USD 500 M for agriculture, tourism and construction projects' research to select the best ones that would then receive financing by the company. “Our goal is to make decisions quickly and directly without any intermediaries so that both countries can have maximum profit from the bi-lateral cooperation,” Prime Minister Borisov is quoted saying. Bulgaria and Qatar Defense Ministries are expected to sign a further agreement for the training of Qatar servicemen in Bulgaria.